Icons are necessary for all the graphic design you want to create, whether you are making a website template or an app. On our website you can find many Free useful icon templates that can help you to make the design better and more qualitative. Choose from our exclusive Icons templates or Icons sets! Download TRAVEL ICONS SET – Vector + PSD to become interesting and original with your design. Absolutely Free templates will be great for summer design and promotions. Download and enjoy! Download Travel Icons Set for creating the best design you wish. Use Photoshop or Illustrator to make all the necessary customizations. Good luck with your design! Download our new Freebie – Business Icons Set for creating interesting and modern design and implement important ideas. Use Adobe Illustrator or Photoshop to make all the necessary customizations. Download and enjoy! If you are looking for interesting elements for your spring graphic design, you are welcome to download our new Freebie – Free Spring Icons Set. There are lots of useful and professional elements in PSD/ AI/ PNG formats. You can choose the necessary one exactly for you and create perfect design. Enjoy! Download our new Freebie – Free Vector Valentine’s Day Icons for your awesome ideas and professional work! There are 14 differrent files with qualitative icons dedicated to St. Valentines day. Download and enjoy the results! Download our new product – absolutely FREE Summer Icons for your special design and awesome ideas! All the Icons are exclusive elements from Free-PSD-Templates. Download and enjoy! 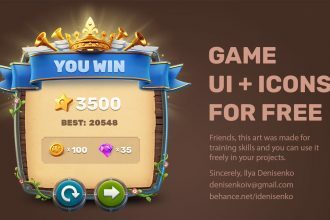 Download this awesome Free PSD Game UI + Icons for free for creating interesting design and use it for your private and commercial goals. After downloading you can customize it the way you wish, add them to the necessary design and enjoy the results! Download FREE 16 Painted Icons Trade IN PSD for your business and corporate design and make it really perfect! All the painted icons can be used and customized absolutely free. Enjoy! You are welcome to download our today’s freebie – Free PSD Flat Design Business Icons Set! This very beautiful and elegant Free PSD Flat Design Business Icons Set is the absolute exclusive template from Free-PSD-Templates! Download it, be interesting for the people you want to show your works and ideas. Good luck! Don’t you like to create many icons for your website or application? Don’t mind. We have created for you this wonderful 45+ SET OF FREE PSD ICONS. Very qualitative and original Set can bring you success and save your time. Enjoy!